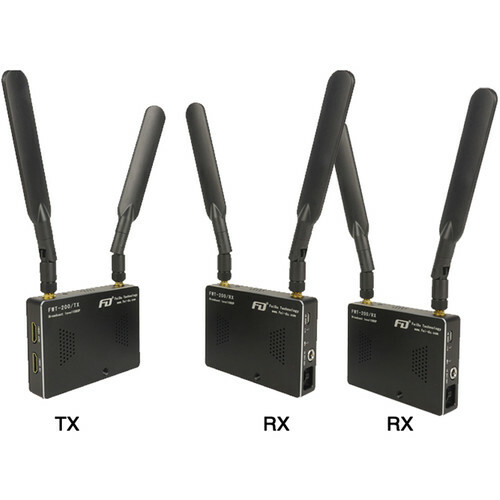 The HDMI Wireless Video Transmitter and Receiver Set from FeiDu includes a FWT-200 HDMI wireless transmitter with two 5 GHz antennas and two FWT-200 HDMI wireless receivers with two 5 GHz antennas each. A 650' line of sight range is supported at a resolution of up to 1080p at 60 fps. Three hot shoe adapters are included for attaching to cameras without 1/4"-20 threads. Three standard HDMI cables, four spare 5 GHz antennas, and a carry bag are included as well. Both the transmitter and receivers can be powered by external micro USB 5V (power bank available separately), 7-25 VDC input, and using an F970, F750, or F550 battery (available separately), which are compatible with the integrated L-series battery plate. The HDMI Wireless Video Transmitter from FeiDu can be used to transmit to up to four FWT-200 receivers (available separately). It supports a 650' range line of sight with zero latency and a resolution of up to 1080p at 60 fps. This transmitter features an HDMI input, an HDMI output, and an integrated L-type battery plate. It can be secured to a camera or other HDMI video source via built-in 1/4"-20 threaded holes. A hot shoe adapter is included for attaching to cameras without 1/4"-20 threads. This transmitter can be powered by an external microUSB 5V (power bank available separately), 7-25 VDC input, or using a F970, F750, or F550 battery (available separately), which is compatible with the integrated L-series battery plate. Two 5 GHz antennas, an HDMI cable, and a carry bag are included. Dynamic Frequency Selection (DFS) function detects radar signals that must be protected against interference from 5 GHz radios by dynamically switching the operating frequency of the 5 GHz radio to one that does not interfere with the radar. The HDMI Wireless Video Receiver from FeiDu is designed to be used with the FWT-200 transmitter (available separately). It supports a 650' range line-of-sight and a resolution of up to 1080p at 60 fps. This receiver features an HDMI output and an integrated L-type battery plate. It can be powered by external micro USB 5V (power bank available separately), 7-25 VDC input, or using an F970, F750, or F550 battery (available separately), which is compatible with the integrated L-series battery plate. Two 5 GHz antennas, an HDMI cable, a hot shoe adapter, and a carry bag are included. The pack of four 5 GHz Antennas from FeiDu are designed to be used with the FWT-200 HDMI wireless video transmitter and FWT-200 HDMI wireless video receiver. These antennas offer a 360° omnidirectional pattern.